Chattahoochee Technical College hosted Georgia Gov. 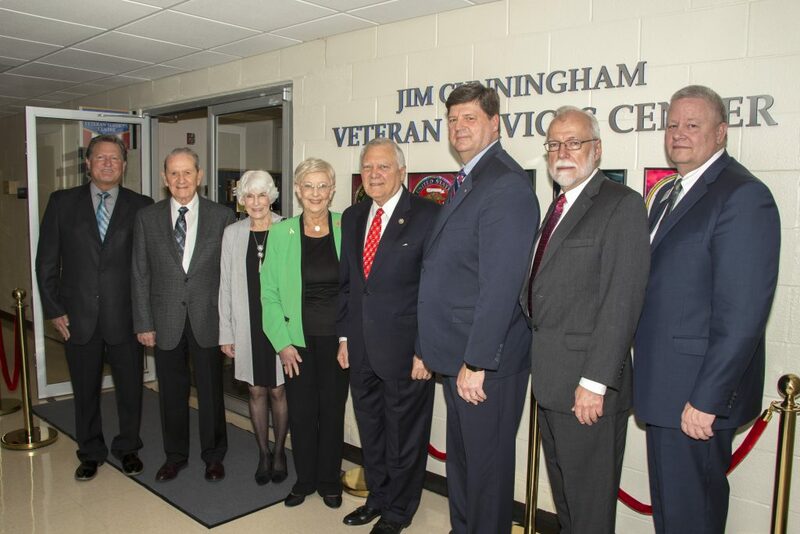 Nathan Deal among many additional state and community leaders at a dedication ceremony on Thursday, April 19, for the college’s newly renovated Jim Cunningham Veteran Services Center located at the Chattahoochee Tech Marietta Campus. The center is named for Jim Cunningham, a 21-year U.S. Army Veteran, who served in Vietnam. He is the father of Jay Cunningham, founder and owner of Superior Plumbing, who pledged $75,000 to Chattahoochee Tech in support of the college’s Veteran Services Center. Shown here, l-r, are Jay Cunningham, Jim Cunningham, Jan Cunningham, Georgia First Lady Sandra Deal, Gov. Nathan Deal, Chattahoochee Tech Foundation Chair Dan Barbour, Chattahoochee Tech President Dr. Ron Newcomb, and TCSG Commissioner Matt Arthur. Shown here, l-r, are Jay Cunningham, Jim Cunningham, Jan Cunningham, Georgia First Lady Sandra Deal, Gov. Nathan Deal, Chattahoochee Tech Foundation Chair Dan Barbour, Chattahoochee Tech President Dr. Ron Newcomb, and TCSG Commissioner Matt Arthur.